Josephine Dondanville, the seventh and youngest child of Ludwig Dontenville and Clara Brumpt was born in Somonauk, Illinois in 1852, two years after her parents arrived in the United States. She spent her early years with her parents on a farm in Serena Township. Joseph Ulrich, second of four known sons of Martin Ulrich and Madeleine Ulrich, was born in Erlenbach, Alsace January 5, 1848. He immigrated to Northfield Township, LaSalle County, Illinois in the late 1860s following other Ulrichs who had come earlier. The 1870 census records that Clement Ulrich and his family, possibly Joseph's uncle, was living on the farm adjacent to that of Josephine's sister Frances and her husband Charles Chalut. It is quite possible that this was how Josephine and Joseph met. On January 25, 1873 Josephine was married to Joseph Ulrich at St John the Baptist Church in Somonauk, Illinois. There were eight children born to their marriage: Clara Anne, 1874; Aloysius Edward, 1876; Maria Ida, 1878; Caroline Josephine, 1881; Joseph Martin, 1883; Mary Elizabeth, 1885; Clarence Henry, 1888; and Louis Ernest, 1891. All were born in Illinois and baptized at St. John's. In 1893 Josephine and Joseph followed her two sisters to Iowa settling on a farm in the North East quarter of Section 21 in Deer Creek Township, Humboldt County. In 1915 they moved to Fort Dodge. They lived to celebrate their sixty- fifth wedding anniversary. Joseph died January 22, 1939. Josephine died in late November of that same year. They are buried in Corpus Christi Cemetery in Fort Dodge, Iowa. Two descendants of Joseph and Josephine Ulrich are known to be researching the Ulrich family. Harry Dolder, in Oxford, Iowa, grandson of Anna Clara Ulrich and Louis Dolder, and Colleen Kelly, in Clovis California, granddaughter of Joseph Martin Ulrich and Catherine Carrigan have provided significant information. 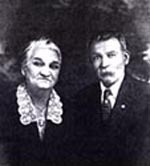 The children of Ernest Ulrich and Helen Hanson have provided similiar information on their family. These efforts have given insight into the lives of these three families. This researcher has only limited information on the other five Ulrich children, and their families.